Fivizzano, Italy, 15" x 11"
The very first plein air picture from last years painting holiday where I was the tutor for a week in the lovely Tuscany countryside (Watermill at Posara). So this was an easy composition to get everyone on my course into the swing of things with a few simple shapes and colours, and if you wanted to, insert a few figures. Well, I had to put in an artist and easel, of course, this being a painting holiday. More details of the workshops I run, please click on the menu item above. La Cala Mijas, Spain, 15" x 11"
A study of a beach bar in the seaside town of La Cala on the Costa del Sol. A large area like the sandy beach has to have something added to it as regards subtle changes in colour, tone and texture (maybe dry brush strokes or some splattering). Here also I have dragged some shadows across the beach. Those shadows along the side of the bar, connect with the silhouetted shapes of seated figures inside. The last touch was to go in with some real dark darks to add a bit more detail to shadows and the building. Venice, Italy, 22" x 15". The Calle Larga and looking at the State Archive building with those horizontal lines. This was a plein air demo to my group at the recent Painting Holiday I ran in Venice. This was an early morning painting and not too many crowds to contend with. Another nice spot in this square is to go on the other side of the bridge and do a contra jour scene looking up the canal. I took a photo so I might do that sometime! Venice, Italy, 22" x 15"
A second plein air from the first days painting on the recent Venice Painting Holiday I ran. This is the footbridge over to the Fondamenta dei Penini, just a short walk from the Arsenale Ferry Station. Looking around this area, there were a dozen possible scenes within 50 metres or so - lots of choices. But for the second one I decided on personal comfort and positioned myself in the shade and out of people's way. Tuscany, Italy, 22" x 15"
A quickie done in about 30 minutes as a demo on the last day of the workshop I held in Tuscany this year. The village of Monte dei Bianchi is up there somewhere. Lovely majestic peaks of the mountains in the distance and the sweeping shadows of the nearby trees I thought made for an ideal watercolour demo without too much detail and the need to put in figures etc. Also done with a 3 colour palette consisting of a blue, yellow and red of course and a neutral tint. Posara, Italy, 15" x 22"
My first plein air demo at Posara, Tuscany in Italy. A quiet village location with the only interruption at 11am with church goers leaving the local church behind us. Well it got so busy we had to put out a warning triangle on the road to warn drivers of us all painting on the roadside. Luckily no accidents and all painters returned safely to base. Painted on Saunders Waterford, Cold Press, 300 gms paper. Venice, Italy, 11" x 15". Venice, Italy, 15" x 11". Well I tried not to get the bridge dead centre, and I think it's just off. Maybe distracted by the left hand boat and figures. With the narrow canals and bright sunshine, reflected light can light up buildings which otherwise could be quite dark compared to the values on the other side of the canal. I decided right at the end to have a foreground shadow crossing the whole scene - just a very faint glaze of a greyish wash when everything was dry. Are you struggling with your watercolour painting? Want to paint in more loose style? Want help on composition or your drawing skills? Want to introduce figures and cars into your landscapes, but afraid to do so? 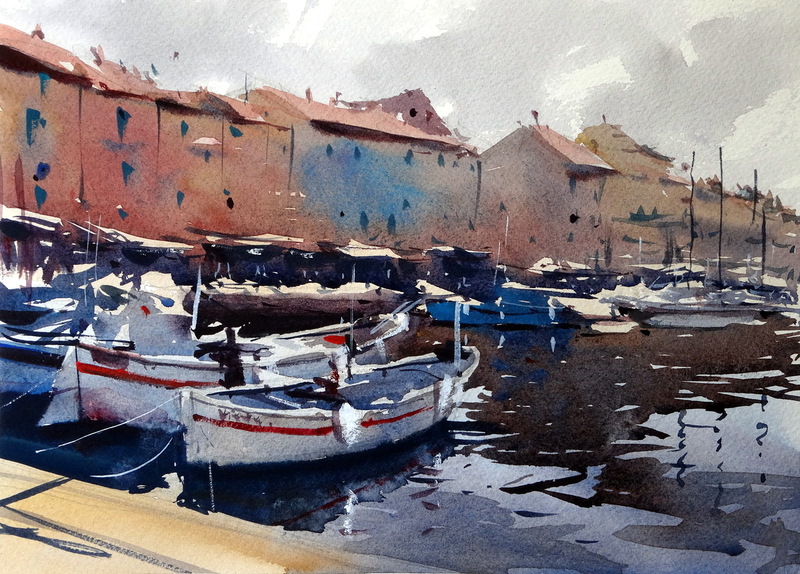 Want to spend a week in lovely Tuscany with fellow watercolour artists? Description Painting with Tim around different locations at the 'Watermill' Posaro in Tuscany, Italy. There will be lots of demonstrations by Tim and one-to-one tuition. Lots of pretty village scenes to paint and the lovely Tuscany countryside. If you are interested in a private, one-to-one session with me, wither at my location or online, please contact me for more information. Paint with me around different locations in Venice for 6 days! There will be lots of demonstrations by me and one-to-one tuition. It is entirely up to you if you want to jump in and out of painting, or you can take advantage of ‘sightseeing’ at your leisure. We paint away from the busy tourist locations, but everywhere is a painting location in Venice. You are of course welcome to site see as much as you want. This week is perfect if you want to come with a non-painting partner as there is so much for them to see and do in Venice whilst you are out and about painting and they can join you with a big discount. You are spoilt for choice in this romantic, historic city. All the pleasure, quality tutoring and congenial company you’ve come to expect from Arte Umbria who are organising this holiday, but this time it will be in this beauteous location. Places are limited so early booking is advised.